forest. He was sleeping peacefully. A playful mouse, for no reason at all, ran across his out-stretched paw. The he ran up the nose of the lion. The lion, feeling something on his nose, was awakened from his sleep. Suddenly he saw the mouse and caught him. The mouse shivered with fear. 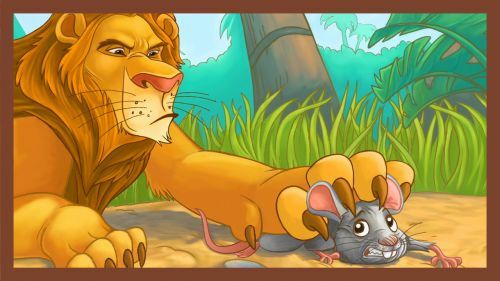 The lion would have killed him, but the mouse cried out for mercy. "Please don't kill me, King Lion! Please have mercy on me! I will never do it again. Forgive me this time and I will never forget it. A day may come, who knows, when I may be able to do something for you to repay your kindness". The big lions laughed at the little mouse's fright and at the thought that so small a creature could ever help him. But he let him go free. The mouse ran happily away. Not long after this, the lion was caught in a net. The net had been put out by some hunters in order to catch him. He was very angry and let out a roar that could be heard far and wide throughout the forest. The mouse heard it too. He knew it was the voice of the lion that he had once made angry. He recalled that the lion had been merciful to him then. So he ran to the place where the lion lay caught in the net of ropes. "Well, King Lion." said the little mouse, "I know you did not think that the daya would ever come when I might repay you, but now is the day". The little mouse set to work at once, biting with his sharp little teeth at the heavy ropes that held the lion. And soon the lion was able to get out of the hunters trap and go free. Thus the little mouse did prove to the mighty lion that an act of kindness, no matter how small, is never wasted.